Fishing the Mackenzie Country Canals for huge trophy trout, and big Quinnat salmon has become hugely popular over recent years. The explosion in angler numbers is all the more remarkable when you consider the distances most must travel just to get there. Many Christchurch anglers are quite unperturbed at having to drive at least 3 1/2 hours each way for a day’s fishing. In fact, so good is the fishing on offer in the Mackenzie Country canals that not only are many anglers travelling down from the North Island, there is also a strong contingent flying in regularly from Australia. With big trout weighing 20, 30 and even 40 pounds, the chance of catching the “fish of a lifetime” is too good to pass up. Charlie about to release a big rainbow in the Ohau A Canal. Sadly, much of the impetus behind so many Christchurch anglers deciding to give fishing the canals a try has come about as a result of the steady decline of Canterbury’s once magnificent East Coast sea-run salmon and trout fisheries. Disillusioned Fish and Game license holders have turned to the canals for their angling salvation. Back in the early to mid-nineties, there were many more salmon running the Hurunui, Waimakariri, Rakaia, Rangitata and Waitaki Rivers. It sounds hard to believe now but plenty of salmon caught back then exceeded 30 pounds. Big salmon are just not seen by Canterbury anglers nowadays. Hopefully, they will return sometime in the future. Getting back to the canals, how come the fish in these featureless manmade rivers are growing so large? There are a number of reasons. Firstly, the Twizel Canals do not suffer from devastating floods that otherwise wreak havoc in streams and riverbeds, tearing out vegetation, washing away bullies, fry, ova, insect lava and so on. Secondly, the canals don’t suffer the ill effects of summer droughts. The environment is very stable with a constant flow of pure, uncontaminated, cold mountain water provides the perfect environment for the salmon farms now well established on the canals. Most importantly the environment is free from pollution. Many mistakenly believe that the big trophy trout living in the canals are only there because of the free food handouts they get from the fish farms. That is in fact not true at all. The salmon farms, first established in the early nineties, may well have acted as a catalyst giving a significant boost to the wild trout fishery in the canals overall, but the fishery is otherwise self-sustaining. 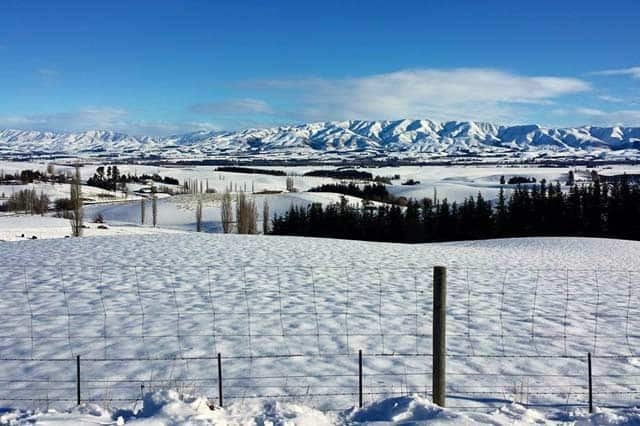 Looking back towards Fairlie and the Mackenzie Basin from the Canals in winter. Much of the best fishing takes place in the canals over winter, when, as you can see in this picture, it gets very cold. Fishing the Mackenzie Country Canals Photograph courtesy of John Collins June 2015. There are plenty of enormous trophy trout underneath the salmon farm cages that no doubt accept any stray feed pellets coming their way, but the main reason there are so many big fish is that trout are cannibals by nature. Young trout start out eating aquatic insects, snails, and so on, together with terrestrial insects that fall into the water. However larger trout prey almost exclusively on bullies, smelt (if available such as in Lake Taupo), mice, koura (freshwater crayfish), and other smaller trout and salmon. A 20-pound trout can catch and eat a 2-pound trout no problem. A 2-pound trout or salmon is going to provide considerably more protein than a few snails and drowned blowflies. The greater the biomass, the greater the opportunities for trophy trout to exist and prosper. Brown and rainbow trout, along with Quinnat salmon, all spawn in the Mackenzie Country Canals over the colder months. The salmon spawn first around April and May, followed by the rainbow trout from April through to June and July, and the brown trout in late winter and into August and September. Personally, if I were trying to catch a fish to eat, I’d want to catch a silver salmon prior to its reaching the spawning stage when their skin darkens and the flesh isn’t as good to eat. Salmon is by far the easiest fish to catch in the canals. They’ll take practically any lure. There used to be quite a lot of escaped salmon in the canals up until about five years ago. The same study mentioned above showed that salmon made up only 5% of the fish found in the canals. Fish & Game works with the fish farmers to release salmon into the canals for the benefit of anglers. Salmon are also spawning naturally in the canals. Salmon, when present, are the easiest for anglers to catch. It seems likely that many young salmon become dinner for big trout! The Quinnat salmon in the canals don’t grow to anywhere near as large as the rainbows and brown trout because their lifespan is shorter. They spawn and die around three to four years of age which means they don’t get any heavier than 15 to 20 pounds at most. The salmon obviously eat very well because those caught by anglers are mostly in excellent condition with relatively short bodies for their weight. When salmon reach a certain size they become immune from predation. 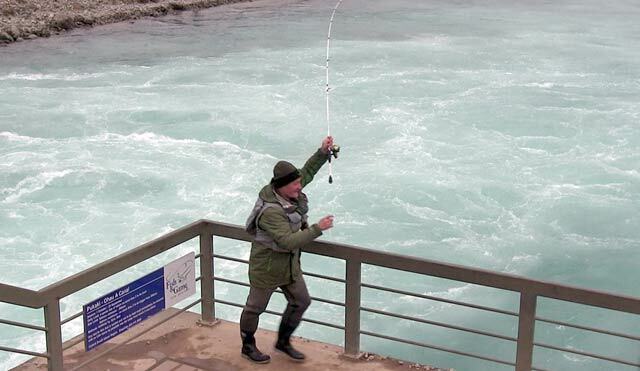 The best spots to catch salmon are close to the fish farms on the Ohau A and Tekapo Canals. Night fishing in the canals can be very productive. Salmon, in particular, will readily take luminous lures at night, as will rainbows. Many big fish are taken under the cover of darkness when trout become less cautious in shallow water close to the edges. Luminous three-inch minnow soft baits are good. You will also find that even a small luminous bead will make a difference to your strike-rate after dark. Casting soft bait minnows on an angle upstream is still very popular. The idea is to allow your three-inch minnow to drift along with the flow as naturally as possible. Don’t wind your reel handle as you would a spinner. Gently take up to any slack to keep a straight line to your lure. The key to fishing soft bait minnows in the canals is to use a jig-head that is just heavy enough to take the soft bait down and have it drift along with the current. If you use too much weight it will deaden the action of the lure and be inclined to get stuck in the weed on the bottom. It is best to err on the side of being a little too light than too heavy. For the beginner, it can be a bit tricky to know when you get a bite. Trout will “mouth” the lure by sucking it into their mouths. If they detect something is wrong they will split it straight back out. These subtle touches can be hard to detect. My advice is to strike on suspicion by rapidly lifting your rod tip and winding any slack line quickly on to your reel. Any discussion about how to fish the canals really needs to encompass bait fishing. This fishing method is extremely popular with many anglers who fish the Mackenzie County Canals because it works. It is effective on big and small fish. The sides and bottoms of the canals are covered with aquatic weed. Any bait fishing rig used must take this into account. When fishing a bottom rig it will be much more effective if a small cork float is used to lift your bait off the bottom and clear of the weed. The hook trace needs to be about a metre long. Some anglers fish a float rig from the surface but the method isn’t as popular as the method described above. I have seen many fish caught with a float rig. The most popular baits are shrimps and prawns both of which are sold in supermarkets. 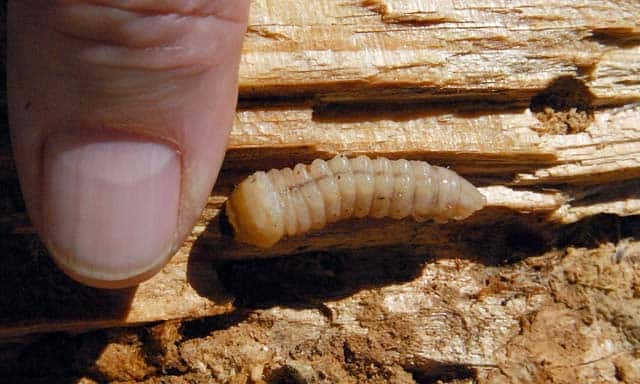 Huhu grubs make very good bait for fishing the canals but more thought and a little work needs to go into securing them. The good thing about bait fishing is that it allows the whole family to take part, even those who aren’t very athletic or good at casting. Bait fishing also doesn’t require modern light-weight trout fishing gear. Huhu grub next to my fingernail for scale. It might be the age of the soft bait but traditional spinners will also take good fish in the canals. 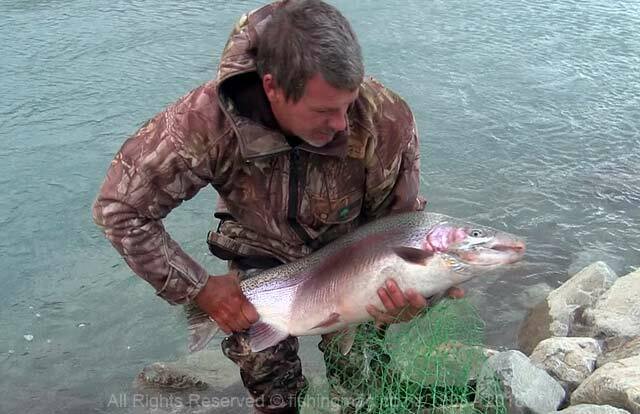 This plump rainbow was taken spin fishing in the Tekapo Bowl on a green and gold colour Tassie. We don’t generally think of fishing the canals with traditional spinners like Tobys, zed spinners, Tasmanian Devils, and so on. However, some of the biggest fish ever taken in the canals have been caught on metal hardware. Rainbows will readily take Tasmanian Devils, particularly when fishing the Stilling Pond known as the “Fish Bowl” at the downstream end of the Tekapo Canal. Hooked in the swirling whitewater of the “Washing Machine” below the Ohau A Wall, the only thing to do when a big fish runs is to run after it. Photograph; Allan Burgess. 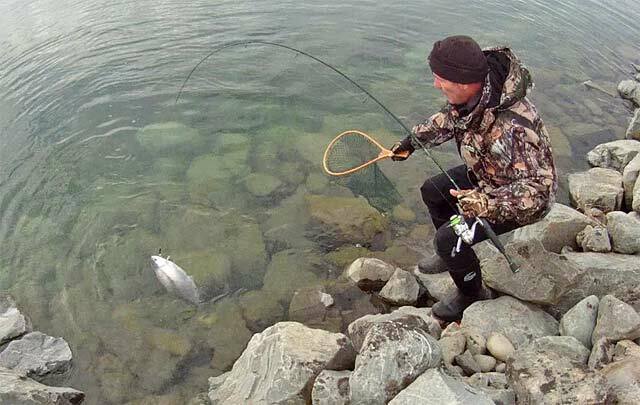 Finally, let’s take a look at fishing for big winter rainbow trout from the Ohau A Wall. When more water is needed to produce electricity the Lake Ohau outlet gate is opened remotely at the concrete dam allowing water to rush into the Ohau A Canal. The whitewater below the gate is a hot spot for big rainbow trout. Some salmon and brown trout are also caught in the churning wash but the angler catch is overwhelmingly big rainbows in full spawning colours. For most trout anglers, fishing the Ohau A Wall is a whole new experience. Obviously, the area is very popular with anglers and can quickly become overcrowded. A sort of local custom has developed whereby anglers take turns walking along the top of the wall on either side of the Ohau A Canal inlet dam as they drift their nymph rigs through the whitewater. I have not witnessed this practice with trout anglers before. It is something similar to the way pole-net whitebaiters take turns at the mouth of the Hokitika. When there are too many fishing to simply return to the end of the line orderly queue forms as anglers wait their turn. The above seems strange indeed but it gives you some idea of just how productive the fishing can be there if anglers are prepared to go to this extreme to share the resource. Fish are not caught from the top of the wall all day. There are certain bite-times when the fishing is really hot followed by quiet periods. It is safe to say that during May through July your chances of not hooking a 20lb plus rainbow there would be practically nil. There are however a number of important tips with regard to terminal rigs, how to play a hooked fish, and so on that will make your chances of hooking and landing a fish much more likely. I have spent quite a bit of time there and have seen all sorts of weird and wonderful angling practices. Some anglers land almost every fish they hook, while others will hook fish after fish without landing any of them. Most importantly I have learned what works and what doesn’t. For a detailed map of the Twizel Canals with all the top fishing spots marked, along with loads of advice on tackle, rods, reels, lines, rigs, lures, flies, baits, methods and strategies to catch big fish, plus heaps more tips, download get a copy of Fishing the Twizel Canals today (Contains 148 pages, 25,000 words, and 185 colour photographs). 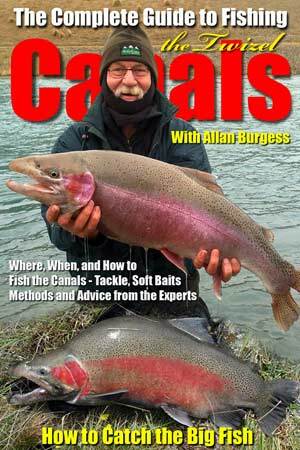 You also get a bonus ebook The Complete Guide to Fishing the Twizel Canals. Fishing the Ohau A Wall in the Mackenzie Country Canals practically guarantees you’ll catch a really big trout. But it isn’t as easy as it might seem. All the finer points on how to fish the Wall, and most importantly the mistakes to avoid are all included in this book.